Whey Protein Isolate, Natural & Artificial Flavors, Cocoa Powder (Processed with Alkali), Soy Lecithin, Salt, Sucralose, Silicon Dioxide. 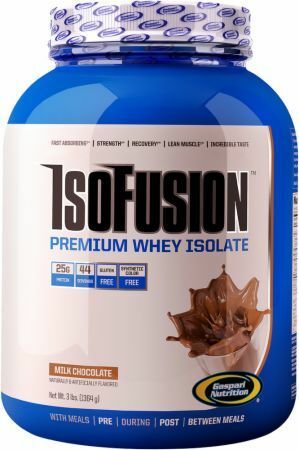 IsoFusion Blending Tip: When mixing your favorite protein powder beverage, feel free to add peanut butter, macadamia nut oil, coconut oil, almond butter, fresh or frozen fruits (bananas, blueberries, etc) or other ingredients of your choice. Add 1 scoop per 6-8 fl. oz. of water. Blend: Add 1 to 2 scoops of IsoFusion to a blender. Blend for 20-30 seconds. Then add 1 to 2 ice cubes and blend for an additional 30 seconds. Stir: Add 1 to 2 scoops of IsoFusion to a large glass. Then mix it up with a spoon. Stir for 20 seconds or until the powder is completely dissolved. Shake: Add 1 to 2 scoops of IsoFusion to your shaker cup. Cover and shake vigorously for 30 seconds. Whey Protein Isolate, Soy Lecithin, Natural & Artificial Flavors, Salt, Sucralose, Silicon Dioxide. In the end you have nothing more than a great tasting protein perfection which leaves you nothing but satisfied. This is why IsoFusion has set the new standard for high quality whey protein isolates for all elite athletes and health enthusiasts around the world.